Well for starters, no, it’s not. But how could it be the ultimate guide to “Mad Men”? It came out in 2012! Back when Lane Pryce was still counting beans and dating bunnies, when Roger was first getting experienced, and when Joan was throwing herself to the Jaguars! Instead it’s a sort of time capsule – a time capsule of a time capsule, as it were – real-time content as it appeared in The Guardian’s blog, hot on the heels of each episode’s debut in the first three seasons, complete with speculations and theories by commentators and the public that we, in our God-like remove, can sit back and smile at. Which, frankly, is a considerable part of the book’s charm, because it’s fascinating to watch viewers and fans do precisely what has made the show so compelling lo these many years – to speculate wildly about what’s happening, why it’s happening and what’s going to happen next. Their excitement and mania are palpable, and they make you remember why you enjoyed the show in the first place. That’s because the book is built from the 21st century version of those cocktail parties – the internet – resulting in a breezy compendium of cultural references explained, reader commentary, inside jokes, and cast interviews culled from The Guardian’s back pages, all hung on a frame of episode summaries. Which means its a book that is uniquely of our time and as such, is as representative of the 21st century as the characters and events in Mad Men are of the 20th. To that point, the book also reveals the dominant marketing trends of the two eras. On the one hand, you have the top-down, monologuing, “I have something to tell you” school that was the bread and butter of “Mad Men” and agencies in the 1960s. And while there was revolution going on, it was ultimately about who that monologuist would be – Don or Peggy – not whether or not monologue was the way to go. Which is a far cry from the “other hand”, the challenges facing marketers today that is reflected in the “many-to-many”, networked and curated feeling of the book. That is reflected in the feeling that author Will Dean, is at much at sea as his readers are. That at times he is more so, as some of the most interesting comments come from those very readers. Which points up another thing that makes this book – and thus the show – fascinating. What resonates for these British readers, and what doesn’t, reminds you not only how provincial the world was in the 60s, but how provincial it still is. I’m thinking specifically of the Season Two Finale, when the events of the day poked through the lives of the characters and created panic, chaos and confusion. When the world held it’s breath as Kruschev and Kennedy stared each other down over the existence of nuclear missiles in Cuba. If you know how terrifying those days were, if you know how many Americans really thought the world was about to blow apart, then you understand in one way things like Pete sitting in his office with his rifle, or Peggy telling Pete about their baby or even Betty’s “dalliance” before telling Don that she’s pregnant. They’re bathed in apocalyptic foreboding. But if you don’t, as the readers in England by and large didn’t (and why would they? Were those missiles 90 miles off of their coast? ), then those scenes – and all they say about those characters – play entirely differently. Pete seems more menacing, Peggy more vulnerable, Betty more disconnected. Perceptions you carry with you through everything they do subsequently. And you know what’s amazing about that? The characters can handle it. They are deep enough and complex enough and interesting enough to absorb almost any amount of understanding, and still function. And thus, while “The Ultimate Guide to Mad Men” may not be “ultimate” in many ways, the fact that it still manages to reveal more layers of this intriguing show makes it, ultimately, worthwhile. 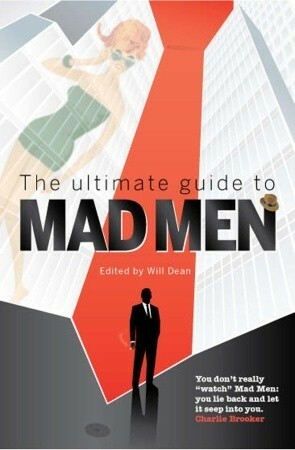 The Ultimate Guide to Mad Men by Will Dean was published by Guardian Books on 08/05/12 – order it from Amazon here or from Barnes & Noble here – or pick it up at your local bookseller (find one here).